Will ILUC save our livestock? 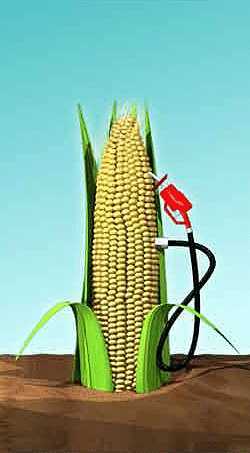 “Biofuels” are combustible liquids made from plants. They can replace petrol and diesel in our engines and are extracted from many different types of plants. These biologically-based fuels have long been supported by green activists because when you burn them they only emit as much CO2 as the plants absorbed while growing. Their CO2 is taken out of the atmosphere and then returned, while fossil fuels add new CO2, removing nothing. Using biofuels adds no new CO2. But it was difficult to ignore the fact that world food prices soared in 2008 as a result of US legislation requiring the conversion of US corn into fuel for motor vehicles. That price explosion led to farmers everywhere seeking to expand their cropping areas, often chopping down forests in the process. Here was another of the unforeseen consequences which seem endemic in climate policies. This led to the new concept known as indirect land-use change (ILUC) being brought into the calculations. If you take a field of grain and sell the crop for biofuel, then somebody, somewhere, will go hungry unless those missing tonnes of grain are grown elsewhere. If the shortfall is grown on farmland created by cutting down forests or draining peat land, it can create enough new climate-warming emissions to cancel out any benefits from using the biofuels in the first place.